It's no coincidence when Grace Elland finds a vodka bottle next to the lifeless body of her boss, motivational speaker Sprague Witherspoon. The bottle is a terrifying - and deliberate - reminder of the horrors of her past. Grace retreats to her hometown to regroup and tries to put everything she's learned about positive thinking into practice - a process that is seriously challenged on the world's worst blind date. Awkward doesn't begin to describe her evening with venture-capitalist Julius Arkwright. She has nothing in common with a man who lives to make money, but the intense former Marine does have some skills that Grace can use - and he's the perfect man to help her when it becomes clear she is being stalked. As Witherspoon's financial empire continues to crumble around them, taking a deadly toll, Julius will help Grace step into her past to uncover a devious plan to destroy not only Grace, but everyone around her. Seven reasons why this was a worthwhile use of a credit at Audible. 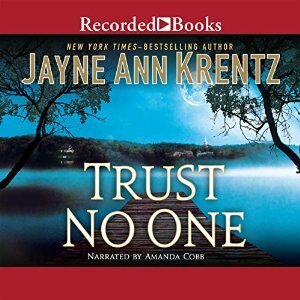 Excellent narration, Amanda Cobb again did a superb job and made it all a very easy listen. A set of mysterious circumstances all entwined and linked. Grace - a charming character who doesn't deserve her life to be turned into the turmoil that happens when she discovers a body. And it's not the first one. She already has nightmares. Grace though is intelligent, talented and mostly positive, she has been the reason why her dead boss has made such an impact. Julius - while Grace doesn't appreciate the blind date her friends set her up with, it turns out Julius might be the one for Grace. Julius is a successful businessman - nothing bad about that! Little surprises along the way. Trust the title of the book - Trust No One, that's Julius' little motto and in this case he's on the money. At the final resolution when the cavalry arrives the women have it all in hand. Oh yeah!It has a happy ever after. - "Love Changes Everything". I really enjoyed River Road by Krentz when I read it last year and Trust No One looks like it's just as much as a page turner. I'm glad to hear this one works well in an audio. Thanks for sharing! Yes I enjoyed River Road too (again on audio!). She has just the amount of suspense I enjoy. Yes Anna she does do a great job, I haven't read her paranormal but I intend giving her a go in that genre. I never did get into this author. I tried one book by her and never finished it, but this one sounds really, really good! It was good Sarah, but not every author is a match for every reader - which is just as well! As plenty of readers to read authors they like.